Australia's most-awarded builder of luxury motor yachts has just announced an inspired new addition to its growing Sport Yacht collection: the elegant Riviera 4800. With her World Premiere scheduled at the 2016 Sydney International Boat Show in July, the impressive new 4800 Sport Yacht will appeal to a wide spectrum of boating enthusiasts given her design and innovation, and most certainly will excite a new generation to enjoy Riviera's luxury life afloat. The 4800 Sport Yacht - with two staterooms and two bathrooms - proudly takes external design cues from the Riviera 6000 and 5400 models, for which there is extremely strong worldwide demand. 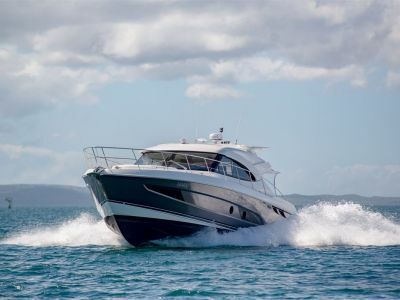 The 4800 has all the Riviera Sport Yacht hallmarks - sleek styling, leisurely single-level living and entertaining features, premium levels of luxury and superb sea-keeping capabilities - embedded deeply in her DNA. For the new 4800 Sport Yacht, Riviera will introduce a robust and responsive new hull that perfectly matches the state-of-the-art Volvo Penta Inboard Propulsion System (IPS). This means owners will enjoy Riviera's spirited performance as well as all the benefits IPS, including joystick maneuverability and the innovative Glass Cockpit navigation and systems monitoring features that make boating today with Riviera even easier and more enjoyable. 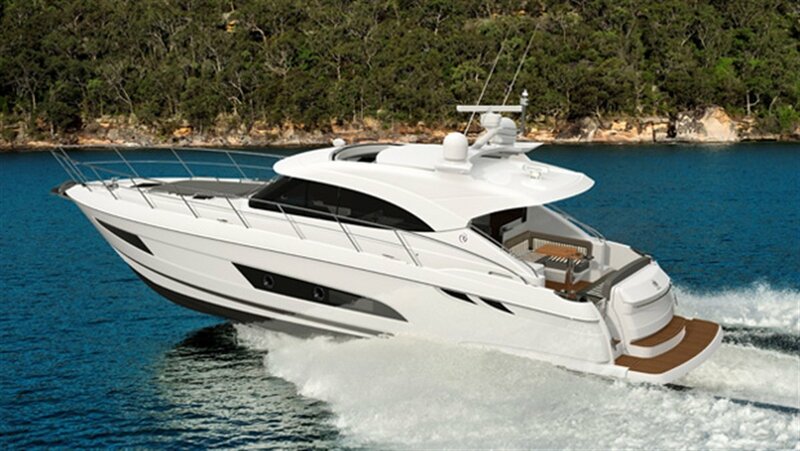 Stepping aboardThe 4800 Sport Yacht's distinctive exterior profile features contemporary hull windows and porthole designs that are recessed for added protection, as well as a sports-styled targa arch and an hydraulic boarding platform. The door to the tender garage, which has enough room for a 2.7-metre tender, is electric and above is a true entertainer's covered barbecue centre, with stainless steel splash-back and convenient LED lighting. 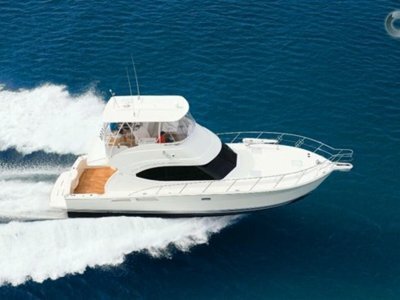 The 4800's fully equipped cockpit enhances the easy alfresco lifestyle valued so highly by Riviera luxury motor yacht owners around the world. Storage solutions abound on the 4800 with cockpit lockers under both the aft and starboard lounges. A hatch is in the cockpit floor to provide access to the servicing pods, while there's also an optional folding teak table to connect both lounges. To port there is a solid surface bench-top, wet bar with refrigeration, ice-maker and sink with hot and cold water tap-ware. And on both sides of the 4800 Sport Yacht, there are steps up to the wide walk-around side decks, which feature raised bulwarks and full-length bow rails for safe access to the forward deck. Here you'll find an additional onboard entertainment zone with speakers under the windscreen brow, a double sun-pad with adjustable back rests and convenient drink-holders. All deck hardware is crafted from marine-grade 316 stainless steel. 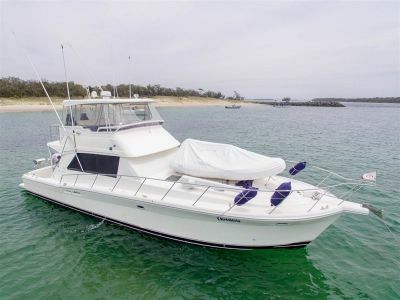 The most discerning Riviera skipper will appreciate the high degree of boating knowledge and consideration drawn up to create the ergonomic design of the 4800's luxury sports-inspired helm. There's ample storage for binoculars, phones and tablets, instrument covers and thoughtfully placed drink-holders, as well as designed-in access underneath the helm to ensure any issues are quickly identified, and service costs are kept to a minimum. The command centre of the 4800 Sport Yacht features the latest Volvo Penta/Garmin Glass Cockpit navigation and systems monitoring features, with two 12-inch multi-function display screens set into the sunken dash. The many benefits of the Glass Cockpit technology integrates with the Electronic Vessel Control (EVC) easy boating features that include Dynamic Positioning System (DPS) for station-holding while preparing lines or fenders, or while waiting of a fuel jetty, as well as the convenience of Auto Guidance that searches through all relevant charts to create a route you can follow, avoiding shallow water, navigational markers and other obstacles. Coupled with the Auto Pilot, it not only shows you the way, it can also take you there. The 4800 will also feature the next generation of CZone digital switching and monitoring system, with a 10-inch control panel right at hand so owners can, at the touch of the screen, select from cruising and entertaining modes, dock unattended mode or full systems shutdown. Within easy reach of the two deluxe helm chairs - which each have folding arm and foot rests - is the premium leather-upholstered steering wheel, electronic engine controls and IPS joystick for easy docking. Visibility through the two curved glass windscreen panels is also excellent, with each featuring pantographic wipers and washers that are plumbed off the fresh water system. Stepping down to the 4800's accommodation deck atrium, the full headroom achieved by clever design is immediately evident. The 4800's flexible accommodation layout gives owners a large atrium lower lounge that can comfortably seat up to five adults. This space is the perfect teenager's retreat, games centre... Or even a quiet work space. At night it can also provide sleeping for an extra guest. Natural light filters into the atrium through from the saloon and the fixed starboard-side hull window, and an overhead hatch opens for fresh air and features a flyscreen or block-out screen when required. Forward is the luxurious master stateroom featuring a queen-sized walk-around bed with innerspring mattress and volumes of storage underneath, with drawers and gas struts for easy access. The master stateroom also features additional storage cabinets with positive locking hardware outboard, with a cedar-lined hanging locker and automatic lighting to starboard and a cedar-lined storage locker with shelves to port. This stateroom has its own private ensuite with contemporary styling and an overhead hatch for fresh air, which also screens for privacy when required. The VIP guest stateroom amidships features full headroom at its entry, where there is a cedar-lined hanging locker at the entry, as well as three adult-sized single beds. There's the option of sliding together the two port-side beds to create a double. The long, fixed hull windows on both sides of the guest stateroom capture all the natural light you'll need, and there are opening portholes to port and starboard that are alarmed to the helm so they are not left open while underway. The day head, on the port-side, also features contemporary styling and premium appointments. Its linen cupboard has a convenient bi-fold door that opens to reveal space for an optional washer-dryer. The 4800 Sport Yacht will feature Riviera's signature clean and thoughtfully laid-out engine room with acoustic and thermal insulation, accessed through a forward cockpit hatch with gas strut and heavy duty stainless steel lockdown. The Volvo Penta diesel engines and IPS pod-drives are set wide apart for responsive steering and stability. This drive package offers spirited performance and fuel-efficient cruising economy.